Item # 315716 Stash Points: 395 (?) This is the number of points you get in The Zumiez Stash for purchasing this item. Stash points are redeemable for exclusive rewards only available to Zumiez Stash members. To redeem your points check out the rewards catalog on thestash.zumiez.com. Accentuate your skateboard, binder or any other flat surfaced belonging with the lighthearted Andy Sticker from Petty Snacks. 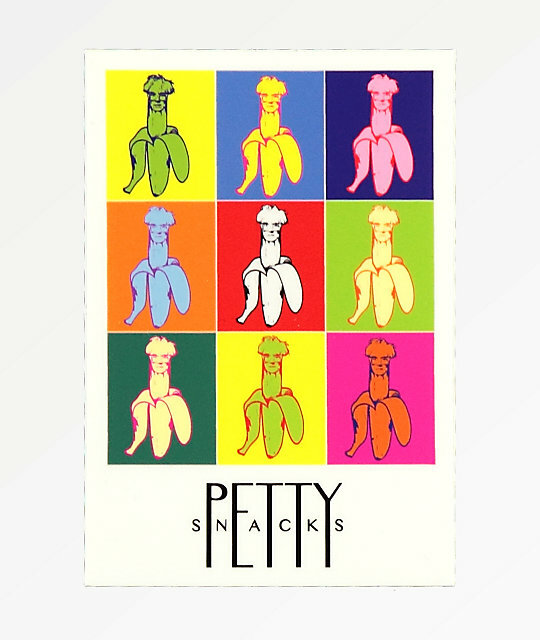 This Pop Art inspired accessory features a colorful print pattern that's complete with signature Petty Snacks logo script. Andy Sticker from Petty Snacks. Andy Warhol inspired graphic print pattern. 2.5" x 3.75" | 6cm x 10cm (approx. ).